These can often have a hefty entrance fee but you have stall after stall of treasures. The first day to any fair event is always the most expensive and there is a reason for this – it’s when all the best bits get sold. The larger fairs are usually in two parts, indoor barns and outdoor pitches. The cheaper pitches are outdoor so if you want a bargain head there as the sellers have a lower overhead. 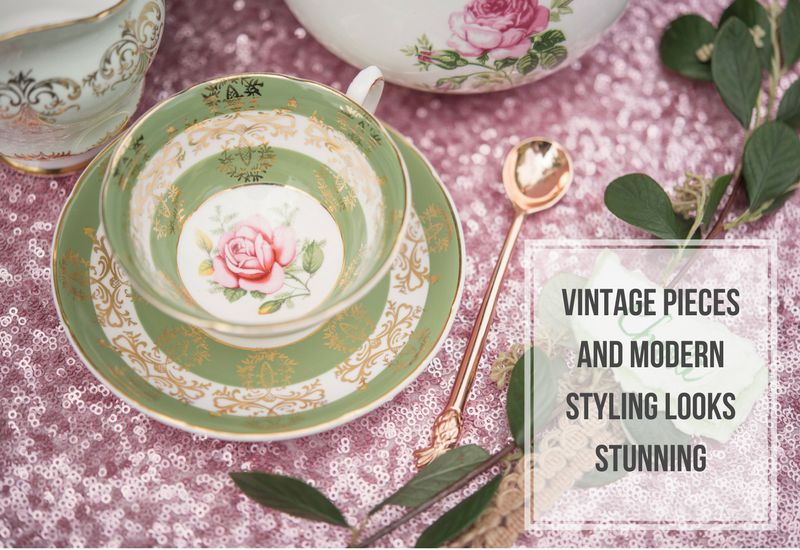 These pitches are usually for the more shabby chic, house clearance and jumble sale stalls which personally I love as this is when I often come across a crate of vintage china hidden under a table – usually dirty and in need of a clean but if you know what you’re looking for, you will spot them. Oh and you need to be there for when the gates open as the professional dealers will also be out hunting. Indoors you will find fine arts, jewellery and more valuable pieces. Always barter! Don’t be shy, the vendors expect to haggle and it’s actually quite good fun. If you want to pay £20 for an item with a £25 tag, go in around £18 and work your way up to a compromise. 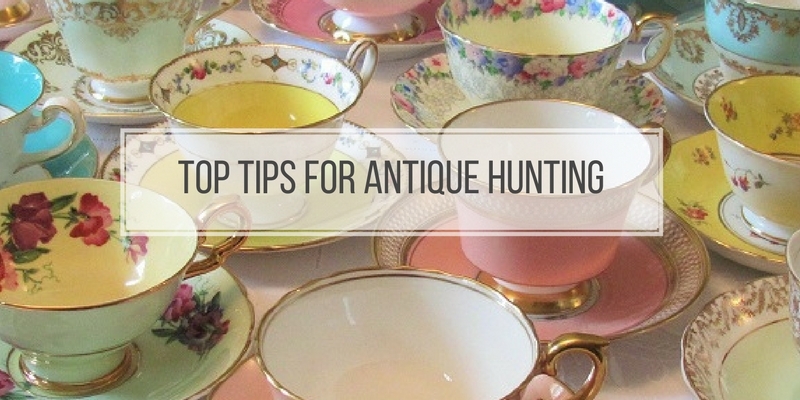 More tips for fairs are to have a big breakfast, dress warm with wellies, make a list of items you specifically want and empty your car just in case you find a furniture treasure you’ll have to shoehorn into your tardis of a car. I’ll never forget the crowd watching me cram a tub chair, apple crates, large mirror and 5 crates of vintage crockery into a VW Golf! Oh and if you see something you want, buy it then and there, because if you come back for it later it will be gone. Most vendors will hold onto pieces you’ve purchased and you then go round them all at the end collecting them up. This saves you carrying items with you all day – just don’t forget where your purchases are! 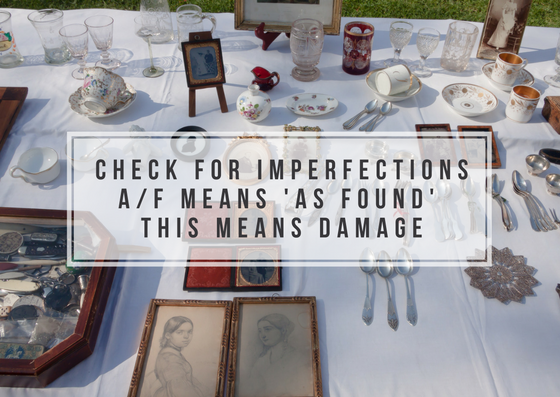 Any items marked with AF means ‘As Found’ – this means there is a fault in the item. Often a bit more hit and miss as to what you will find and it’s definitely the case of the early bird catches the worm. Do your research as to which sales to attend. The best are the nice little local ones where they limit the type of sellers. You don’t want to be trawling past rows of market stalls when its home treasures you’re seeking. My husband is not a fan of car boot sales but I found them enjoyable when my little ones were babies. I was already up at the crack of dawn and in the summer it was a nice start to the day to go for a wander in the fresh air and sunshine. As my children grew, they also enjoyed the sales as their £1 spending money would go far – books, toy cars etc. while I would search for treasures. They would call it the shop in the field. Don’t forget to take your sturdy shopping bags with you and lots of loose change. Take more money than you think you’ll need as there’s nothing worse than discovering a great find, but being miles from the nearest ATM. I love the excitement that comes with an auction. Look online to find those local to you or specific to your needs. There’s often separate days for different types of sales e.g. furniture, jewellery, crockery and glassware. You can usually view items in advance of the auction date and this can be in person and sometimes via an online catalogue. There’s often a guide price but you can also look up items on sites such as Ebay to see a typical sale price to help give a guide. If you go along on the sale day with the intention to purchase, you need to register your details to get a paddle (to hold up when you bid). Before the auction starts, have a maximum spend in your head as it’s so easy to get carried away with a winning determination and bid more than intended – know when to back out if its escalating. If you can’t make the auction date you can register your bid with the auction house and they will bid for you. There is usually a charge for this service but if you really want the item, its worth paying. If its large furniture pieces you are interested in, speak to the auction house before the sale regarding delivery fees as they often offer this service for local deliveries. Online purchases are the easiest as they can be made from the comfort of your sofa with a cup of tea in hand, however they are the biggest gamble as you can’t see the items in person and you are relying on the sellers description. I’ve been stung a few times but also had some great bargains. Often Ebay auction sellers don’t realise the value of the items they are selling. For Ebay the best bargains can be found under the ‘Auction’ and ‘Collection Only’ filters. Often sellers will say ‘in good vintage condition’ now depending on what you are buying this is not a great description as it means ‘it’s not in good condition’ – it looks old/faded/damaged. Ask the seller for a more detailed description. When looking for vintage china pieces I always ask for a condition report regarding the following: glaze (I don’t want crazing), gilt (I don’t want worn away gold details), in-tact (free from chips and cracks). Ask for an image of the back stamp – if it has a mark through the manufacturers stamp, this means it’s a second in quality – ask what the default is. Often it’s a minute smudge in the design or a dent in the glazing but often if can be more obvious and will dramatically reduce its value. If dimensions aren’t stated ask for them. I once purchase a beautiful teapot for it to arrive as a dolls house miniature! Jugs and teapot sizes can be requested in pints to give an accurate idea of size as pictures can often be misleading. 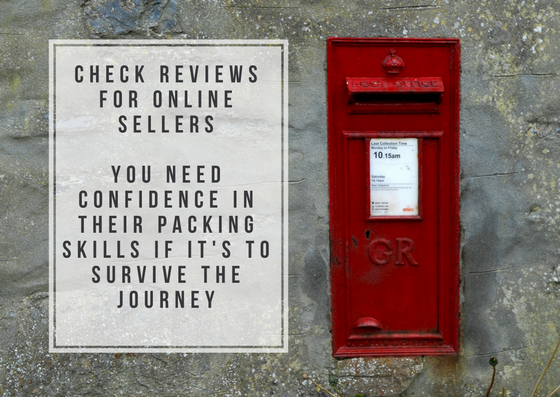 Before making an online purchase take a look at the seller’s reviews. You need to have confidence in their descriptions and to know they will package it well as once it’s posted its fingers crossed it arrives in one piece. If a sale is local to you ask if you can view the items before placing a bid, most sellers are ok with this. As satisfying as it is to purchase bargains for your wedding, if you only get to 25 tea sets or dinner services out of the 150 required, hire in the remaining items to make up the collection. Just remember to put a sticky dot on the base of your pieces to differentiate them form those hired in! P.s. if you do need to hire additional items, click here and send me your remaining shopping list.